Imagine it’s the year 2117--and a family member has just inherited a trunk of your quilts. What will YOUR quilts say about YOU? Do they say what YOU want them to say? It’s a great question about legacy and how we want to be remembered. By extension, it prods us to consider whether we are making the quilts that will create the heritage we wish. If not, why not? 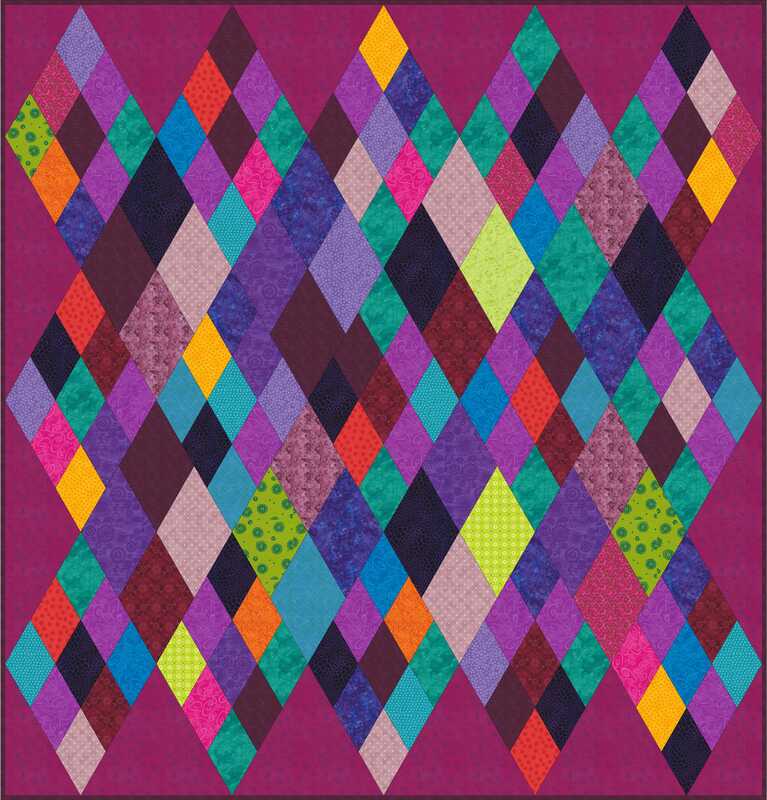 Should we change (or set) goals for our quilting? The three purposes overlap, but depending on the quilt, the priority differs. All three are immediate needs for me — I need to express myself. Quilts made from love and compassion, however, may have a different duration of impact. And that depends on the receiver more than it does on me. I’ll never know most of the people who receive my “compassion” or donation quilts. I hope the owners feel the warmth of the “blanket” as well as the intention. And I hope the quilts are loved, used, and washed until they are used up. The quilt below was a wedding quilt given a few years ago to friends. It hangs on their living room wall. We visit often enough that I can still enjoy it, and they boast of how it can be seen from the street, as well as inside. What legacy do I want to leave with my quilts? I hope that when I die, my loved ones will tell stories about my quilts and my quilting. Stories like how I took over our son’s bedroom for studio space while he was in college (and how he still hasn’t gotten over that, several years later!) Stories about a granddaughter working on a little brother’s quilt with me. 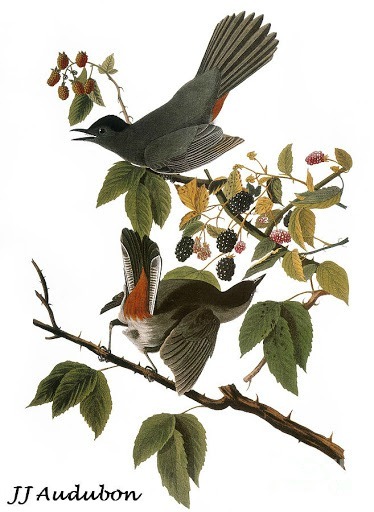 Stories about the round robins my sister and I did. Stories about how a daughter and I got each other the same quilting book one year, a book long out of print and wildly expensive. I hope they will share the quilts I made with others, and I hope there are no pristine, never-used quilts of mine to discover one hundred years from now. This entry was posted in Creativity, Quilting and tagged Goals, Legacy, quilting, Setting goals on January 18, 2017 by Melanie McNeil. A few weeks ago I asked my personal trainer if she could help me define some fitness goals. I’ve already achieved my daily functionality goals (YAY!!) Beyond basic health needs, and being able to quilt with physical ease, I want to have strength and endurance for the day hikes Jim and I enjoy. I’d like a clearer sense of what training program I need, what markers at the gym I need to meet to achieve that goal. Note that goals or commitments are not the same as challenges. The goal is the end point, while the challenge is a barrier to reaching the end. Opportunities are creative pathways to breaching the barriers. With the example above, a goal is to be able to hike with enjoyment. The challenges and opportunities are offered by my personal limitations and the physical training to get there. I wrote about challenges and opportunities here. Another way to think about goals is to ask, if you knew you only had one more year to make quilts, which quilts would you choose to make? Would they be gifts for family members, or donation quilts, or quilts to challenge your skills? Would your goal be to finish UFOs rather than to begin (and hopefully finish) new ones? 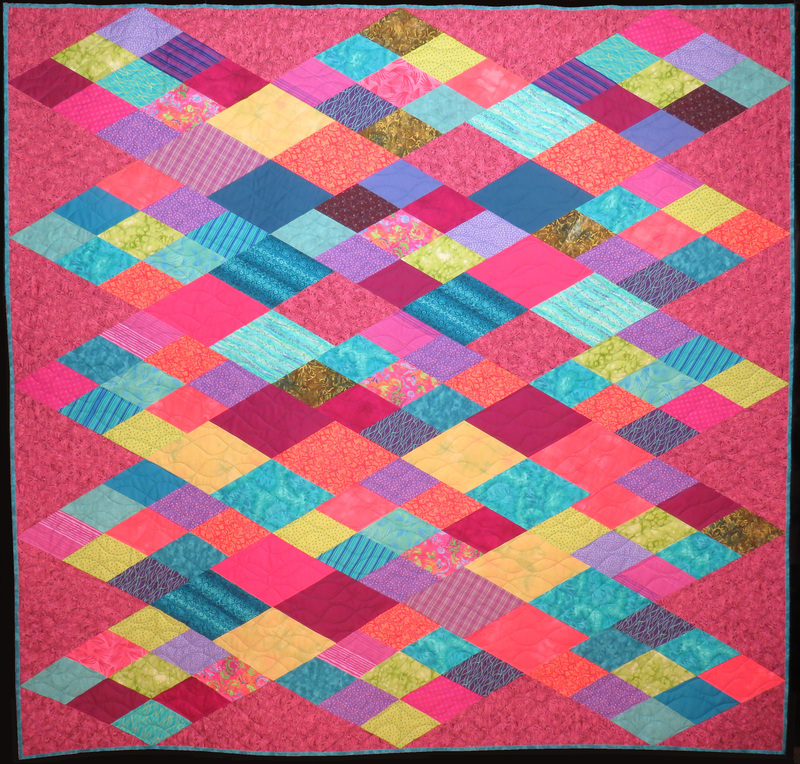 Or would you want to spend your quilting time working with friends, regardless of finishes? Cleaning up bedroom, realize you need a pair of scissors. Go to kitchen to get scissors. Notice the floor is sticky, wipe up spill. Get coffee, go back to bedroom. Realize you forgot scissors. Go to kitchen to get scissors, past washer & dryer. Realize you need to start laundry. Take out clothes in dryer, put them in the bedroom. Realize you forgot scissors. Go to kitchen to get scissors, carry them to bedroom. Realize you forgot why you wanted scissors. And quilting is just like that! Finish an important project; realize you have a deadline coming up for a guild project; look for fabrics to begin that; pull a favorite fabric you’ve intended to use for something else, as well as eight more pieces to go with it and the pattern; head to the kitchen for coffee; sit down at the computer for a few minutes; get distracted by someone’s Instagram post and decide that’s the thing you want to make next! How will you spend your time? How will I spend my time? I want to focus on what is most important to me, on things to which I’m emotionally committed. Sometimes it is easiest to start with the negative. What I am NOT committed to? 1) Making quilts for family. 2) Using scraps for the sake of emptying the scrap drawer. 3) Finishing projects in which I’ve lost interest. 1) Making projects that create puzzles for me to solve. 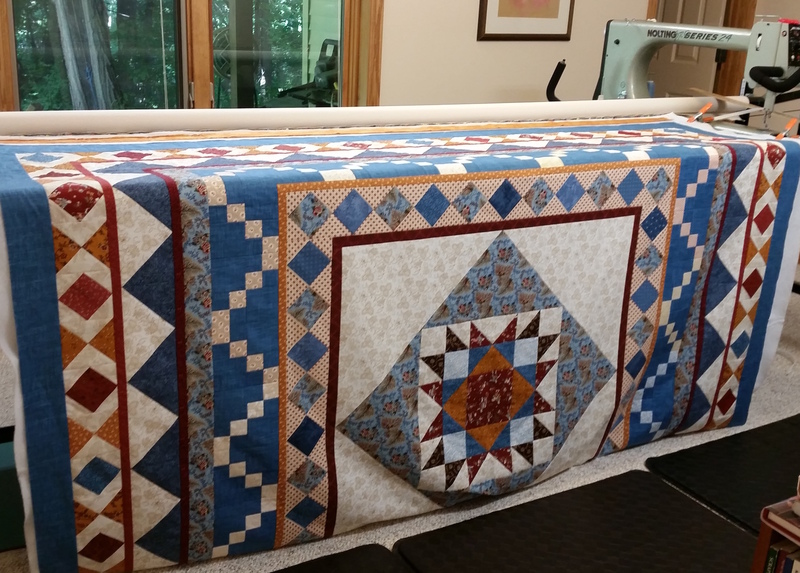 2) Teaching, both in person and on the blog, especially about medallion quilts. 3) Working with my local guild on quilts and other projects. 4) Building relationships with my small group. These do describe how I want to use my time, but are they goals? Maybe not. They’re certainly not well-defined. A lot of sources on goal-setting recommend developing specific, realistic, measurable goals, and setting deadlines for attainment. ::sigh:: I guess this is why people fail at New Year’s resolutions. But honestly, while I did this small exercise, I clarified for myself that “using scraps” for its own sake is NOT one of my goals. 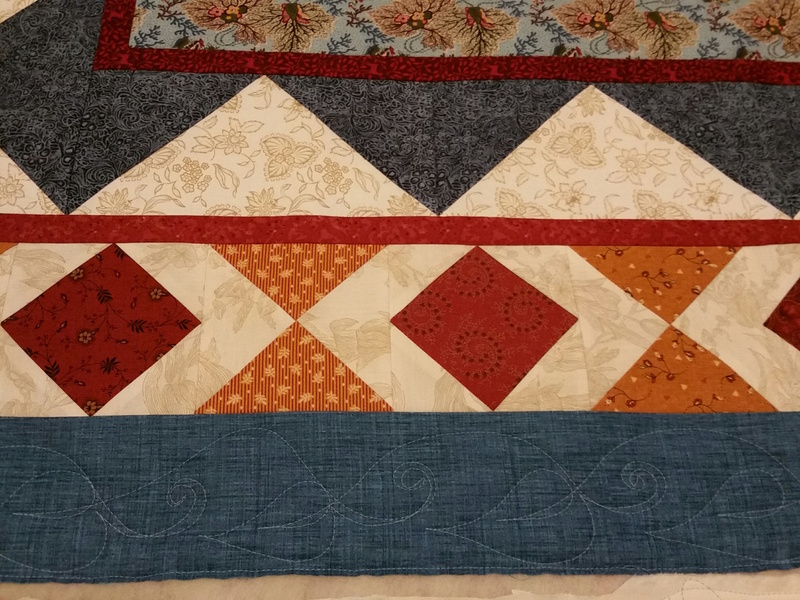 I don’t need to clean up piles of cuttings by making more quilts deliberately from them. Okay. Goals. I have a goal related to commitment #4. One of my small group members developed a mystery quilt project for us, and I will participate. It is a specific project, it is realistic and measurable, and has a rather nebulous time frame of some time early this year. I actually can use scraps in it 🙂 though most of my cutting will be new. It will help forge the camaraderie of our group. And as a mystery quilt, it also suits commitment #1. I have my new project. 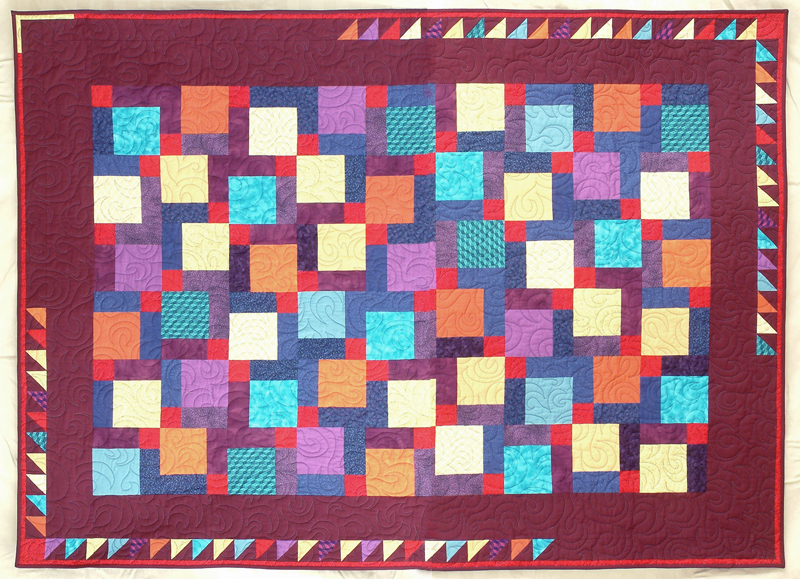 Have you developed goals for your quilting? How successful are you in meeting them? Is your current project lined up with those goals? I’d love to hear in comments. 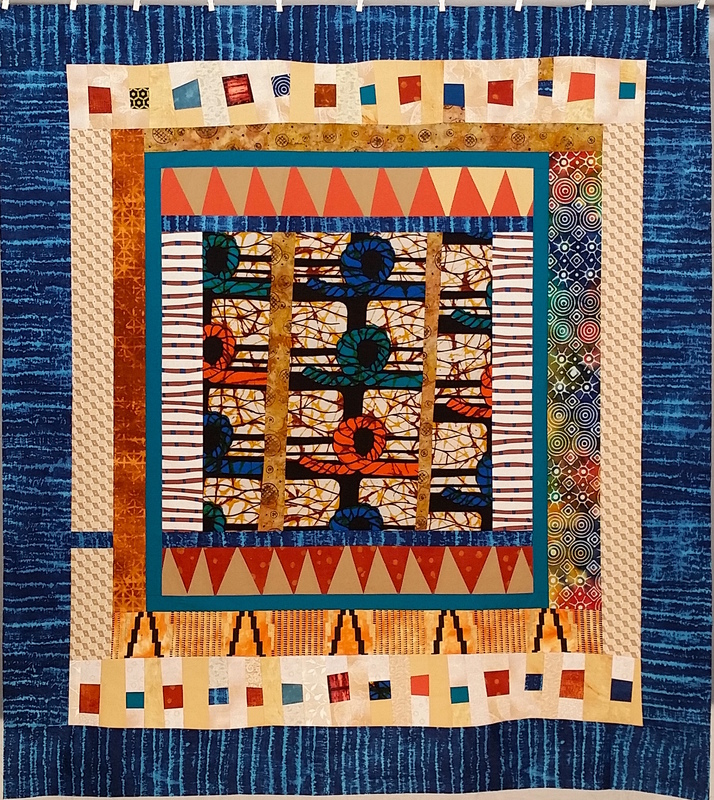 This entry was posted in Personal, Quilting and tagged Goals, quilting, Setting goals on January 13, 2017 by Melanie McNeil. So I wrote in an email to a friend two years ago, and so I shared with you in my last post on balance. Identify my priorities. It’s something I’ve been thinking about a lot. Sometimes it is easy to know where to spend my resources. Other times it’s not as clear. Things are muddled right now. I have few ambitions. I have no bucket-list quilts to make. I don’t need to clear my stash. I’m not writing a book or teaching a class. There are no milestone quilts to make for loved ones. I don’t need excuses to buy fabric if I want. And while I’ve largely recovered from messing up my left knee, my right one has taken a major hit. Physical therapy starts Friday. Doc says I shouldn’t expect to be back in a normal groove until the end of the year. Today? Going downstairs to my studio was possible, but not easy. I do have some goals, some plans. I have an appliqué project I should spend more time with. I’ve volunteered for my guild’s program committee to schedule speakers, and also to help with next year’s quilt show. I’m almost done organizing my digital images of quilts, from all sources — two laptops, three flash drives, and at least a couple of “cloud” spaces. All of these things can be accomplished with minimal physical capabilities. Besides these, I have two VA hospital quilts in progress. One is the project you’ve seen. The top is done and the back is ready. I have another in process. It’s a 6 x 8 layout of hourglass blocks. The darks are all blues. I haven’t cut the lights yet, and I won’t for at least several days. And I volunteered to quilt several donation projects for my guild. We have around 80 tops ready to be quilted. People like to make tops, but finishing is harder. Obviously, right now I can’t do any. Once I get some strength and stability back in BOTH legs, I should be able to do a few. From a more philosophical view, I do have priorities. I want to continue to make quilts that are rewarding to me. Rewards come from varying sources. Sometimes it is from design, sometimes from color, sometimes from the challenge involved, sometimes from ease. But I don’t have a notion of what my next quilt will be, after the VA quilts. Right now I don’t feel very powerful. I feel kinda weak, wimpy, slow. So my highest priority right now is to get my physical strength and flexibility back. As I said the other day, sturdy and flexible — that’s the goal. I’ll work on that. The rest will follow. This entry was posted in Personal, Quilting and tagged Goals, Priorities on October 13, 2016 by Melanie McNeil. In the last post I showed you the quilt I’m working on now. It’s intended as a donation for our local VA hospital, to warm a vet with the love stitched into it. You can see the blocks below. I talked about choosing the layout, and how using an even number of blocks across, when there are alternate blocks, can lead to an unbalanced layout. My EQ7 isn’t working properly right now, or I would show you a picture I create. Instead I’ll show you from Roberta Horton’s book Scrap Quilts: The Art of Making Do. 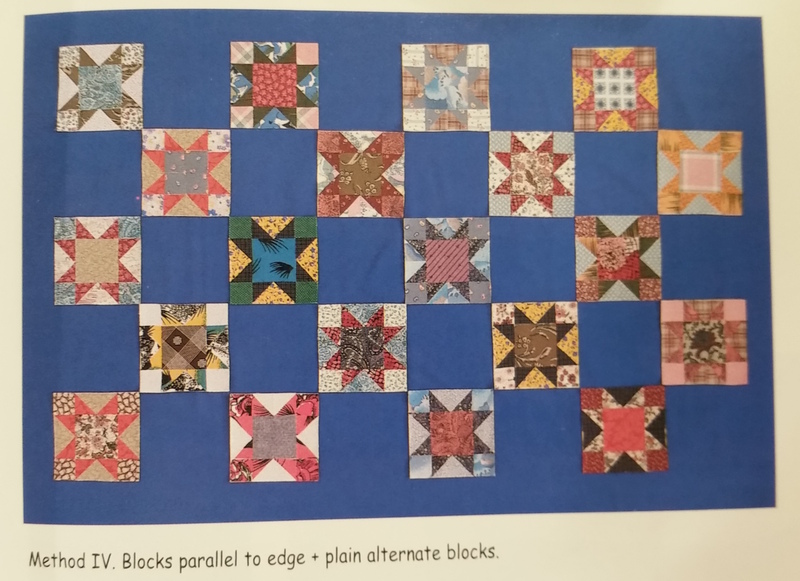 From Roberta Horton’s book Scrap Quilts: The Art of Making Do, page 19. Notice that there are three star blocks on the left and two on the right, making it asymmetrical. If there were another row across, giving three and three, the arrangement still wouldn’t have left-right symmetry. The lack of symmetry makes it feel unbalanced. If you’re a quilter you know how physical our making can be. I get up and down off the floor once a piece is too big for my design wall. I walk up and down stairs, 15 steps each time, to get to my studio. 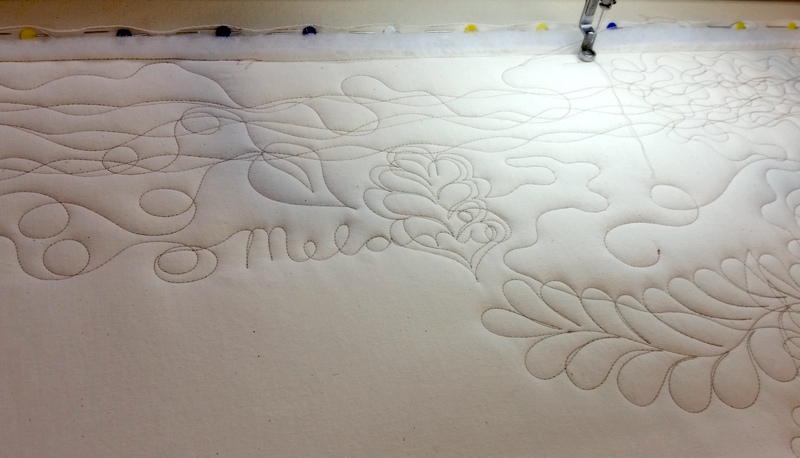 I stand for long stretches when quilting at the longarm. And even sitting at the domestic machine requires good core strength to keep from hurting my back. I need this all to be easier again! I decided it was time to ask for professional help. I’ve started working with a personal trainer at a local gym. So far we’ve assessed the problem (and she agrees with my evaluation, but in much more specific terms.) And she’s begun showing me the type of work I’ll do to get back on track. I’m looking forward to improving my strength, flexibility, and endurance, and to getting my balance back. I’m also pondering how to set myself up to finish the year well. The key to doing what I want is knowing what I want. That sounds simple, but you know as well as I that sorting priorities isn’t always easy. I finally figured out my magic formula, this funny 3-legged stool … I have to identify my priorities correctly so I can balance my resources right. And I have to get my balance right to maximize my power. Being sturdy and flexible is about being powerful, able to create and to endure. Identifying priorities is about being powerful, in just the same way. Identifying priorities. That is the task I’m working on now. I’ll talk more about that another time. 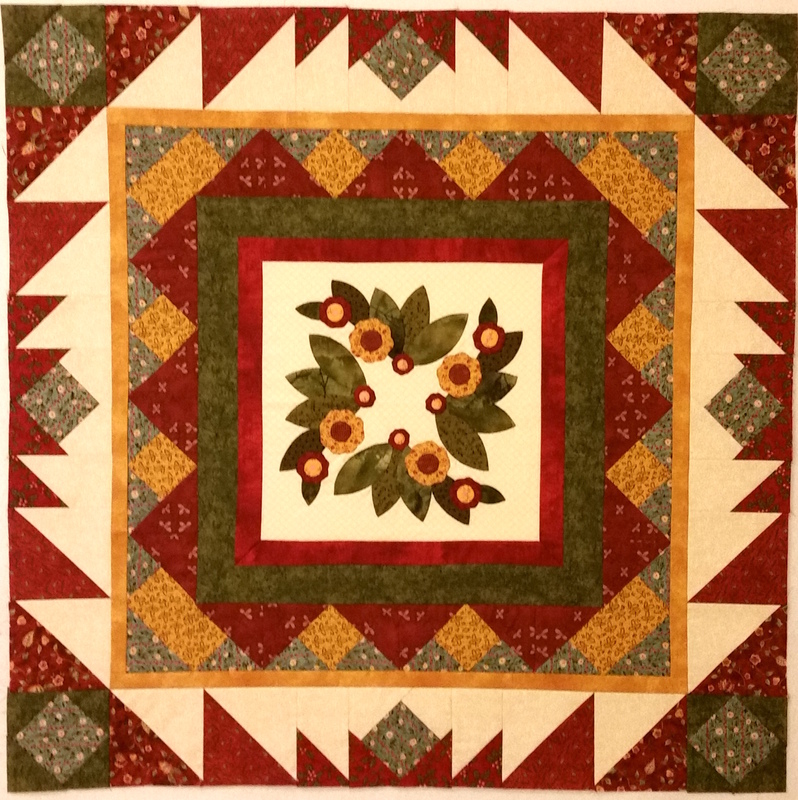 This entry was posted in Creativity, Quilting and tagged Balance, Goals, Half square triangles, Priorities, Roberta Horton, Shoofly blocks, Visual weight on October 7, 2016 by Melanie McNeil. Untied. I’ve been hand-quilting this with a hoop for the center, and no hoop for the rest, which I can reach more easily. It’s been on hold for a couple of weeks, but the center is almost done and soon I’ll move to the outer borders. They should go a little more quickly. Update: the center is done and I’m working on outer borders. Testing. This actually is my highest current priority, and it is what I’m working on today. I put plain muslin on as backing and top fabric and used a scrap of polyester batting between. To evaluate the tension, I am using a different color of thread in the bobbin than on the top. I think it’s adjusted pretty well now, but the batting scrap is a different loft than I usually use. After a few more squiggles, I’ll switch to my usual brand and test some more. Update: testing went fine. I’ll continue to create test strips before starting quilts. But I’m hopeful now that my tension problems are much improved. Local guild challenge. 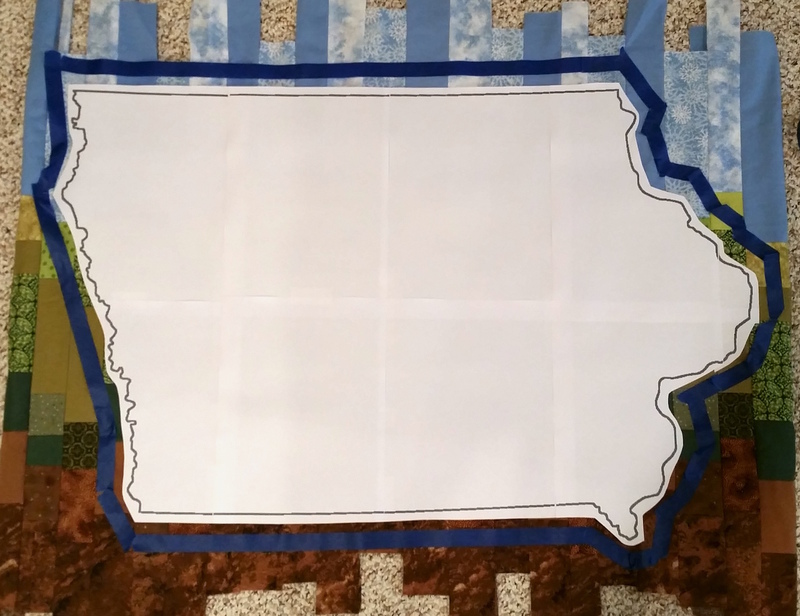 This year’s guild challenge is to create a quilt inspired by Iowa. “What does Iowa mean to you? Corn and prairie grass? The Old Capitol Building? Family and friends? In 2016, Iowa will be 170 years old and we thought we should show everyone what Iowa means to us through our quilts. There is no size or technique limit to this quilt.” This is a hard project for me because I can’t easily distill my thoughts and emotions into a design concept. However, while instant-chatting with my son one evening, he described the Iowa in his mind as he flew over early this year. I’m still working on how to incorporate his words. The challenge meeting is in July, so time is running out! Update: my concept is developing. I’ve chosen words, roughed out a wind turbine, stitched highway I-80 across the state, and determined how to paint fields. It’s moving along. 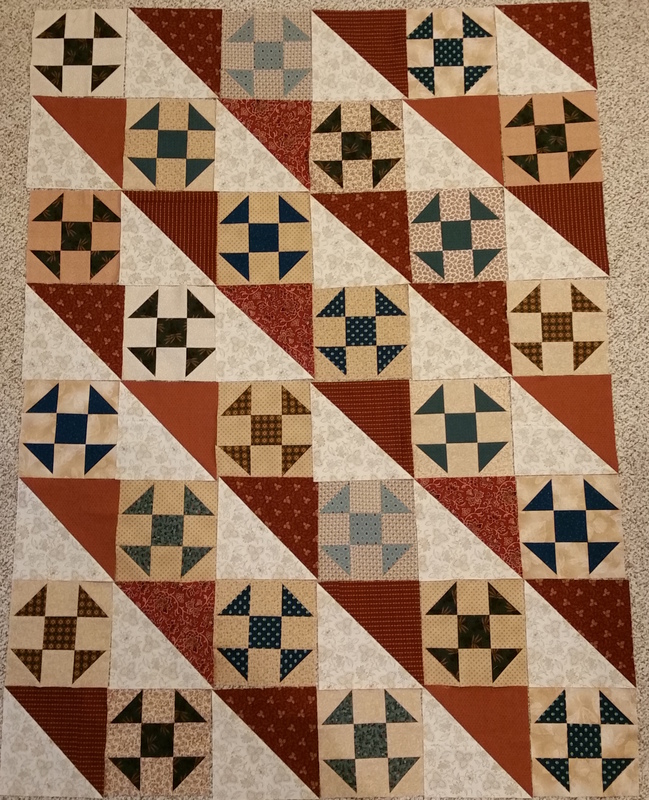 This entry was posted in Creativity, Quilting and tagged Goals, lists, Progress, to-do list, Work in process on July 1, 2016 by Melanie McNeil.